There is virtually nothing good for you on the menu at Hattie's. Alright, we'll give you the rice and beans -- but other than that there is pretty much nothing good for you on the menu. Even the vegetables are fried. But Hattie's isn't a place you go if you want a salad. For some folks it's the place to go when they want southern fried chicken, home made hush puppies, dumplings or fried okra. 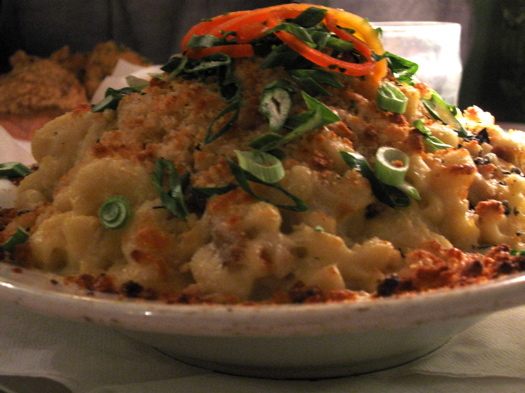 For us, it's the place to go for rich, creamy, artery-clogging-good macaroni and cheese. The ingredients in Hattie's macaroni and cheese are simple enough: macaroni, extra sharp cheddar, butter, heavy cream. Nutmeg and bay leaf are as fancy as it gets. Still, macaroni and cheese is one of those things that sounds simpler than it is. Sometimes it's too soupy, but more often it comes out like a brick. At Hattie's the consistency is just right. The macaroni isn't swimming in cheese. There's just enough to make it tasty and to help it hold together. Add chicken -- fried, of course (you can also pick andouille sausage). Top it off with crumbled home made biscuits and more cheese. Is it your basic cardiologist's nightmare? Sure. But we all have to go some time. And we're thinking there are worse ways than death by macaroni and cheese. Seriously, Hattie's macaroni and cheese is a "once in a while meal" that's ideal for cold winter nights. You know, like the ones we're having now. But don't wait too long. You can only get the mac and cheese from October through April. Not looking to brave the cold? Chef Jasper has the recipe on Hattie's website, so you can try it at home. We're not sure it will be the same with out Hattie's homemade biscuits on top, but it's worth a shot. Oh, and hey -- we're free for dinner. We're just sayin'. Hattie's supposedly had some awesome chowder during Chowderfest, as well. It must have been, cuz there was a block and a half long line just getting in. We skipped it to save the hassle. After seeing the gorgeous mound of mac n' cheese in your review, I checked it out with my husband and we were really impressed. I can't say it's the best I've ever had since I'm from the South, but I suspect it's the closest thing to home up here. Great mac n' cheese, spicy andouille, crispy and moist chicken, yummy biscuits and terrific sweet tea (need bigger glasses though!). My only complaint was the fried okra special, which had a very heavy, unseasoned breading that we didn't care for. Regardless, we'll be back, I'm looking forward to trying the gumbo. Actually, they have really good fish specials at Hattie's. Supposedly the chef loves to cook fish, and he is very good at it. The fish specials are usually relatively healthy. Also the jambalaya is not too bad for you. Several other great recipes from Hatties are posted on their profile page on www.thesaratogalife.com. The Mac & Cheese is awesome! !